The case against the Kansas City Royals for negligence based on the acts of "Sluggerrr," the team's strange crown-headed lion-like mascot, has been reinstated by the Missouri Court of Appeals. If you've been following this story as I have, and why wouldn't you, you will recall that the plaintiff was injured at a Royals game in 2009 during the now-apparently-traditional fourth-inning "Hotdog Launch," when Sluggerrr launched a hot dog into plaintiff's eye socket. (Sluggerrr does launch dogs out of an air cannon on occasion, but this one was delivered by hand.) Plaintiff sued, alleging he suffered a detached retina. In what may or may not have been a related development, there was somebody new in the Sluggerrr outfit the following year. 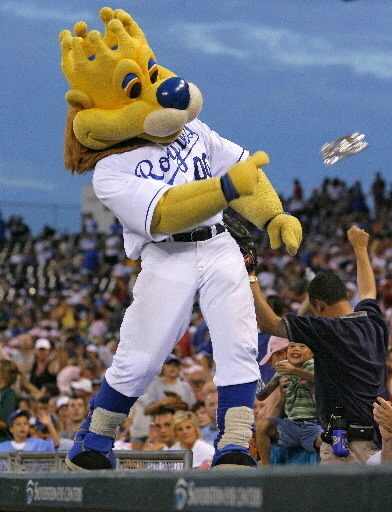 See "New Royals Mascot Reportedly Training to Avoid Further Hot-Dog Incidents," Lowering the Bar (Feb. 26, 2010). In a February 2011 motion for summary judgment, the Royals argued that the hot-dog-throwing event "is an activity so intimately intertwined with Royals baseball that one who attends a Royals game assumes the risk" of being injured by a hot dog, in much the same way that one assumes the risk of being hit by a foul ball. Plaintiff said no, this is more like the California case in which a spectator was hit by a ball after being distracted by a seven-foot-tall dinosaur that poked him with its tail. Of course it is, the judge ruled, and denied the motion. The case later went to trial, and in March 2011, a jury found in favor of the team. by a ball,” because “the risk of being hit by a baseball is a risk inherent to the game.” [cite omitted] However, the risk of being hit in the face by a hot dog is not a well-known incidental risk of attending a baseball game. Consequently, a plaintiff may not be said to have consented to, and voluntarily assumed, the risk merely by attending the game. Emphasis added. The court also held, though, that it was not a mistake to submit comparative fault to the jury. That is, if there is a retrial the jury will again be instructed that some fault can be attributed to the plaintiff even if the complete assumption-of-risk defense doesn't apply. For example, here the plaintiff "looked away prior to the hot dog allegedly being thrown, despite facts from which it could be reasonably inferred a hot dog was about to be thrown." This argument may reduce, though probably not eliminate, any recovery plaintiff may get after a retrial. Please stay alert at future baseball games, especially in the presence of facts from which it can be reasonably inferred that a hot dog is about to be thrown. Or just wear goggles.